I was tired of our backyard whining all the time about all the other neighborhood backyards and how they were so awesome and their owners let them have grills. Forget telling it that it’s not mature enough for one yet, it doesn’t even have a comfy deck or a working pool – backyards are notorious for not listening to common sense arguments. So we bought a grill. Of course, as for most purchases made by this household, extensive research was necessary before committing to grill ownership. Charcoal or propane? How big? Do we need a side burner? We checked out Consumer Reports (I highly recommend it for pretty much everything) to get an idea of what to look for in a good grill, but we also checked out the customer reviews on various websites, because while Consumer Reports does a good job testing things, a lot of problems only arise after you’ve owned the product for a while, and we wanted to know about them. 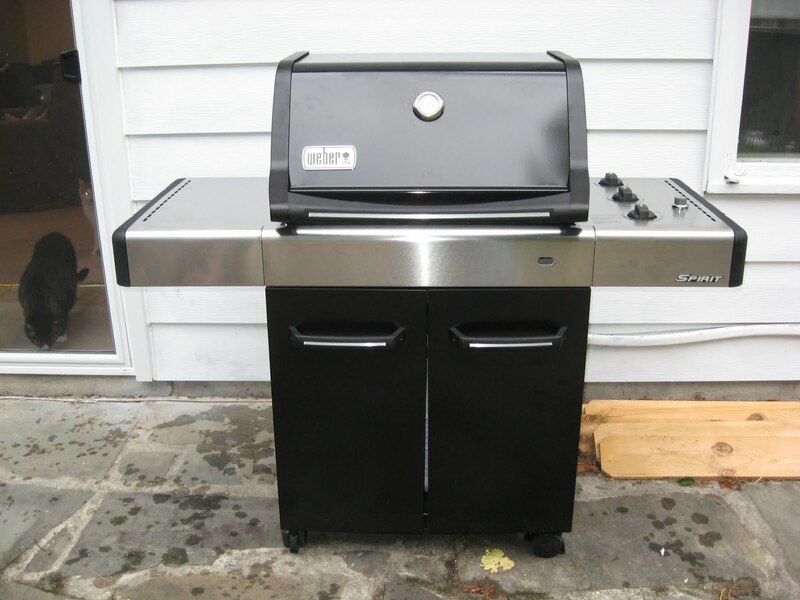 And yes, some of the reviews are lame or obvious fakes, but I like to learn that the paint flakes off after a month of use, or that the knobs broke off in the first year, or that the grill bars are spaced just wide enough to lose a hotdog through. Those things are important! 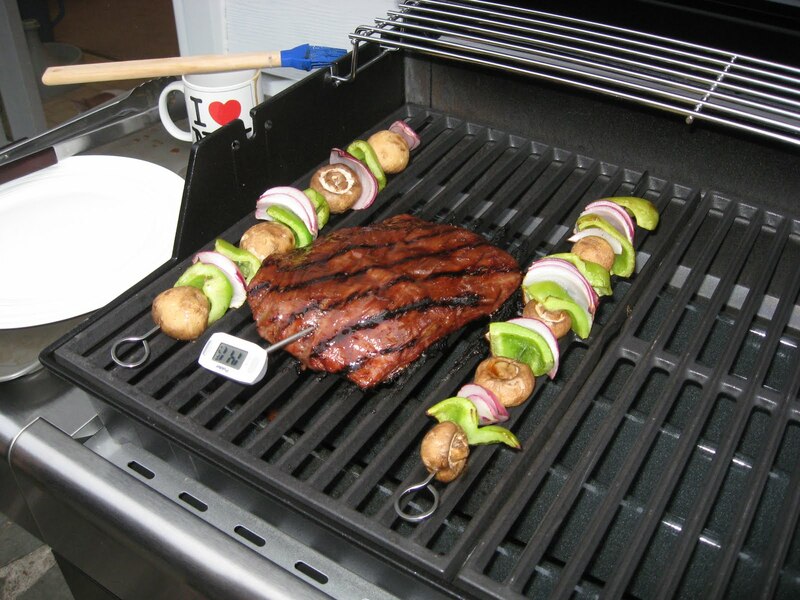 We chose propane, because while we both love the taste of food grilled over charcoal, it’s really too much of a hassle. The heat-up time and the cool-down time add too much time to the grilling session and would get to be annoying. We may still go get a small charcoal grill, one of those Sputnik-looking ones on spindly legs, but for now we like the convenience of being able to shut the gas off and not worry about the grill when we’re done. We also skipped the side burner, because we’re never going to use that. We have a stove. Maybe someday, in a power outage, I’ll regret not having a burner on the grill, but I doubt it. Did you know that the home improvement stores indicate grill size by the number of hamburgers you can fit on them? Seriously, I couldn’t find a “square inches” measurement anywhere. The one we ended up with was right in the middle at a hamburger rating of 36. And the nerd in me was frustrated that we weren’t given a value for the surface area of a standard burger patty. How can I make an educated decision if you refuse to educate me? There’s a new “Infrared” cooking technology that is all fancy and popular right now. From what I understand, it’s sort of like having an oven instead of a grill, because it uses indirect heat. It’s supposed to be better at keeping food from drying out and it prevents flare-ups and it is apparently the height of awesome, especially for steak. We looked at a couple and decided it wouldn’t work for us, because we like food to be charred and crispy sometimes, and the infrared technology keeps the flames completely away from the food. They’re hidden under a metal sheet in most models, so it really is like having an outdoor oven, and while I’m sure it makes some great food, the expense didn’t seem worth it for me. This was a situation where Consumer Reports was loving these products, but the customer reviews gave a clearer picture. Yes they’re great for what they are, but if that’s not what you want in a grill, you’ll be disappointed. We ended up with a Weber Spirit E-310. Webers are more expensive but they have a very good warranty and they’re not famous for nothing – the difference in quality was obvious when we were checking them out at Home Depot. The grates were heavier and well-made, the shell was sturdy and solid, and the grill seemed stable when we tried to wiggle it. It has only one usable shelf, because Weber decided to put the starter and knobs on the other shelf instead on the front face of the unit like many other models choose to do. That’s the only irritating thing about it so far. We’ve grilled steak and hot dogs and it’s done very well. There’s a rotisserie attachment we can buy, which is battery powered and will let us cook a couple of chickens in this thing, and I’m tempted. But I think we’ll just play with the grill surface for a while and see how it does with chicken and sausages and burgers first. And I get to play with marinades now! I was forbidden from marinating anything we cooked on the Foreman grill because it would stick, so now I get to go nuts and marinate everything! This entry was posted in Uncategorized on July 21, 2011 by antijen. Weber is a very good brand and I have BBQ envy now. My little Weber Q100 just doesn’t measure up to this big momma of a grill..